James Hale Pearce was born in Datchet in 1897. Historically, his family had been of quite high status in the village. His great-great-uncle and aunt, George Hale, 1762-1838, and Ann Pearce, 1774-1852, occupied the complex of Church Cottage premises, working as blacksmiths and farriers specialising in the care of horses. George and Ann didn’t have any children of their own and when George died in 1838 (his gravestone is in the churchyard), two of Ann’s nephews, born to her brothers John and William, inherited the business. These two nephews, James Pearce, 1811-1851, our soldier’s great grandfather, and his cousin George Pearce, 1818-1852, carried on the blacksmith business with their families and developed a thriving carpentry firm as well, all in the Church Cottage complex of dwellings and workshops. William Corden’s 1877 painting of Datchet during a great flood, left, records the blacksmith’s workshop on the corner opposite the church. The smithy was little more than a temporary shed since it had to be replaceable in case of fire. The family name ‘Hale’ must have had a special significance because both nephews used it in the next generation. George named his son George Hale Pearce and James named his son, (our soldier’s grandfather), James Hale Pearce. He, in turn, named his son, James Hale Pearce; and his son, our soldier, born in 1897, became the third James Hale Pearce. The apparently secure future of the Hale Pearce family had fallen apart with a series of deaths in the 1850s: that of Ann Hale; her nephews James and George Pearce; George’s son George Hale Pearce, and another nephew, Alfred Frederick Pearce. The family businesses collapsed and by 1861 only James’s widow Elizabeth and their son James Hale Pearce I were holding on. The family interest turned to carpentry and the building trades which would be booming in the village during the next few decades. 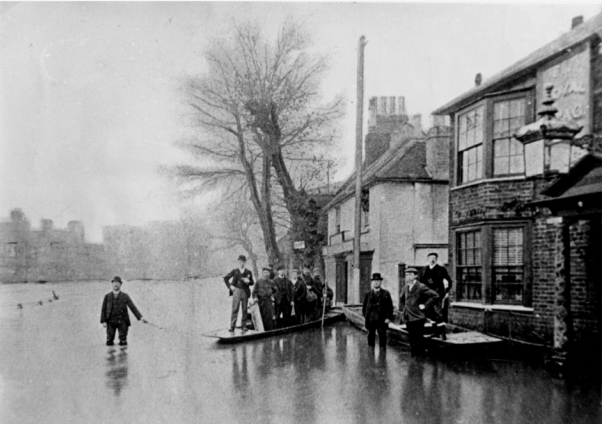 In this 1894 picture of the flood in Datchet, left, James Hale Pearce I, 1848-1898, our soldier’s grandfather, is standing third from right. The photograph lists ‘Mr Pearce, undertaker’ (carpenters were very often also undertakers). He lived at Horton Cottage. Our soldier’s father, James Hale Pearce II, 1867-1943, became an electrical wareman. 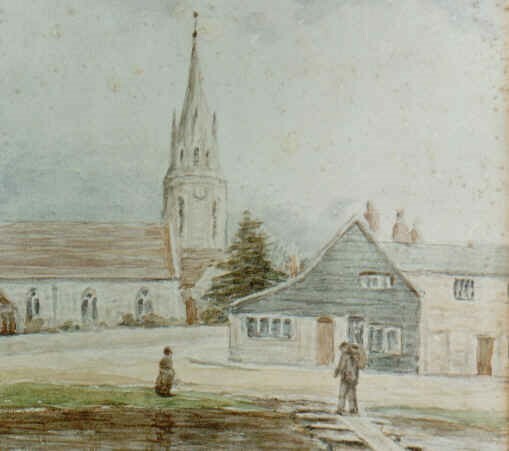 At the time electrification of factories and households was becoming more widespread and he worked with Mr Bridger, the electrician of Slough, to install electric light in St Mary’s Church, one of the first buildings in Datchet to have it. James married a London girl, Ellen Annie Stevens, in 1895 and by 1911, James and Ellen and their only son, James Hale Pearce III, our soldier, were living at The Links in Buccleuch Road (believed to have been on the site of the current number 12). The house had six rooms and the family took in boarders. Ellen was still living there in 1947 according to the Kelly’s Directory of that year. Young James was great friends with another boy from the village, Sidney Burfoot whose family ran Fenn and Burfoot, the boating business on the riverside. Both boys were both scouts: the scouting movement was just beginning to take off after Baden Powell’s Scouting for Boys was published in 1908. James and Sidney were said to be inseparable and the pair were also good friends with Arthur Widcombe from Montagu Road. James was educated at Windsor Boys School from 1911-1913, and then became a trainee telegraphist at the Post Office. In April 1915, he signed up for four years in the Territorial Force. He was initially considered unfit because of his poor eyesight but this was rectified when he was fitted with glasses. His proficiency as a telegraphist was also tested as part of the enlistment procedure. Mr Buttriss, Trade Overseer at the Post Office in Windsor declared him to be “A fair telegraphist”. James joined the Signal Service, the wireless section of the Royal Engineers, 67th Division. Initially he was 3583 Sapper, 3rd Home Counties Divisional Signal Company. The following month he became 538448 Sapper 2nd Home Counties DSC. His military papers show that he was 5’8”, weighed 9 stone 12lbs and had a chest measurement of 35” fully expanded. His physical development was said to be good and he had four vaccination marks. He was billeted at Dedworth for a time and was afterwards moved to Sevenoaks, Tunbridge Wells and Canterbury. Then he was sent to Bedford for telegraph and gas tests, and again moved to Fenny Stratford and Newport Pagnell for a wireless course, then back again to Bedford to be fitted out ready to go overseas. He got through his drills very quickly, perhaps due to his scout training, and despite a brief spell at the Military Hospital Canterbury in March 1917, where he was treated pharyngitis, he was said to be thoroughly enjoying his life in the Army. After serving at home for three years and 74 days, from 16 April 1915 to 28 June 1918, he was transferred to the Royal Engineers Base Service Depot and joined the British Expeditionary Force as part of the 62nd Divisional Signal Company, attached to the 62nd (2nd West Riding) Division (General Byng’s). He landed in France on 30 June 1918. James kept a diary, written in pencil, the whole time he was in the Army. This recorded how much he enjoyed receiving parcels from home and while he was in France he scratched out the dates daily, looking forward to his return home. James was gassed on 19 October, during the Battle of the Selle, part of The Final Advance in Picardy. He was admitted to No 3 General Hospital at Treport on 22 October. His records reveal that it was a Lachymatory Shell The Germans used two types of gases, lachrymatory which attacked the eyes and asphyxiating which attacked the lungs. The gas formed by lachyrmatory shells was usually very heavy and hung low over the ground like a mist. It lodged in woods, hollows, trenches, shelters and cellars and its irritant effect would be felt for several hours. These shells were used against positions that the Germans didn’t intend to occupy but wanted to deny enemy access. As soon as his parents received the news of their only son, they headed straight to his hospital bed at Le Treport but arrived too late. They arrived on the Monday and he had died there two days earlier, on Saturday 26 October 1918. He was 22. News has been received in Datchet of the death of three lads from the village who were about the same age, close friends, and only sons. They are Corpl Arthur Widcombe, Wilts Regiment; Pte S W Burfoot, London Regiment, and Sapper James Pearce, Royal Engineers. Corpl Widcombe was in the fight at Cambrai this year and probably was one of the brave Wiltshires who fell in that action, as he was returned as ‘missing’, mention being made in the Express at the time. On Friday morning last week, Mrs Burfoot received a letter from her son’s platoon officer, informing her that Pte S W Burfoot succumbed during an advance from a gunshot wound, suffering for only a very short time, every attention being paid to him under the circumstance in which his regiment was placed at the time. Pte S W Burfoot attested in November 1915 and joined up in May 1916 but was at home until October as being not old enough. At the latter date he was attached to the Queen’s Own Oxfordshire Hussars and was on the East Coast for a time as a dispatch rider. From there he was sent to Ireland in January 1918 and on August 10 went to France having then been transferred to the London Regiment. During the past advance stages of the war he had been much service. Within a few hours of the receipt of the message in Datchet surrounding Pte Burfoot’s Death, Mr Pearce received a wire to say that his son, Sapper James Pearce was seriously ill through being gassed and asking him to go to France. His parents at once went but on arrival at Le Treport last Monday morning, learned that he had succumbed. [He had died on the Saturday.] They received every consideration from the officials and learned that everything that was possible had been done. The nurses bore testimony to his fine character, but his dying wish to see his parents was unhappily not possible. Sapper J H Pearce was in the Wireless Section of the Royal engineers and entered the Army on April 16 1915. He was engaged in his work in various parts of England, before being sent to France on July 1 1918. Much sympathy is expressed in the village to the parents of these three young soldiers whose lives seemed full of promise. Their supreme sacrifice will ever be remembered in the annals of the village. James Hale Pearce was buried at Mont Huon Military Cemetery, below, at Le Treport, a small seaport, 25kms north-east of Dieppe. Le Treport was an important hospital centre and by July 1916, the town contained three general hospitals. As the original military cemetery at Le Treport filled, it became necessary to use a new site at Mont Huon. There are 2,128 Commonwealth burials of WWI in the cemetery which also contains more than 200 German graves. James Hale Pearce served three years and 194 days in the Army. He was awarded the Military Medal for bravery in the field, and the Victory Medal and British War Medal. James Hale Pearce is also remembered on Datchet War Memorial and on a wooden plaque in the Post Office, Peascod Street, Windsor.